This is SO FUN! What is? Listening to and Reading the Rolfe, Iowa, 1980-81 Oral Histories. UPDATE 1/30/2013: This post was written in 2009. The oral history project is now complete via funds raised through private donations. My eyes are twinkling as I write. I’m so pleased with the response (i.e., purchases as well as ooohs and ahhhs) related to prints of Mother’s watercolors. If you are tuning into this blog for the first time, the short version is that Mother, Marion Gunderson, painted watercolors from at least as early as 1933 and as recently as 2000. Mother was also the librarian…a librarian very passionate about her work…at the Rolfe Public Library from 1963 until 1998. During that time, 1980-1981 to be exact, she spearheaded the oral history project in which over 100 Rolfe, Iowa, community members were interviewed, mostly by other community members. Those oral histories were recorded on audiocassette tapes and also transcribed. 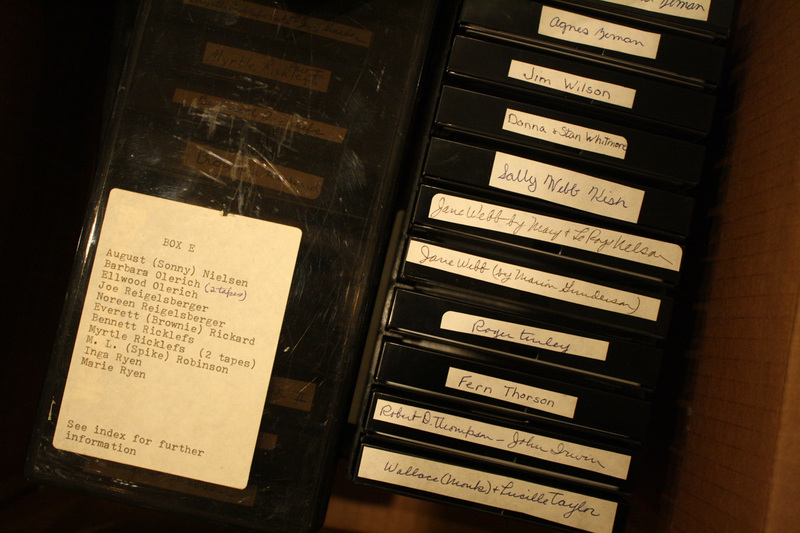 Both the audiocassette recordings and the transcripts have been housed at the library since 1981. The transcripts are available for reading at the library. At some point they will be scanned before the quality of print fades more. Because the quality of audiocassette tapes also diminishes over time, the need to digitize the recordings (i.e., putting them on audio CDs) has been recognized by the library board. In conjunction with the board’s support for this digitizing project, the profits from sales of prints of Mother’s watercolors will go toward the cost of digitizing. This is where the community’s and/or families’ and friends’ of the interviewers and interviewees (even if long ago) help is sought. Sponsorships are requested for digitizing specific tapes. A sponsorship of one tape entails $29.96 (including sales tax). This provides two archival quality CDs for the library AND one CD for the sponsor. Not just for me, and not just for people like my dad, but for anyone interested in the history of Rolfe, or Iowa or Midwest history in general, I have no doubt you will be pleased if you sponsor one or more tapes. Donations to the project in general are also greatly appreciated. A spreadsheet including the names of the interviewees, and of interviewers (if names of the latter were written on the tapes and/or transcripts) has been developed. Also, an informational Q & A sheet explaining the sponsorships is available. Both the spreadsheet and Q & A sheet are available at the “oral histories” link on this blog and at the library, including at tomorrow’s (Sunday, December 6th) 2:00 tea. They will also be available at tomorrow’s Holiday in the Heartland at the RAM Event Center (former school) in Rolfe from 3:30 until 6:00. If there’s something I didn’t explain well on the Q & A sheet and/or spreadsheet, of if you simply don’t want to mess with those sheets, you may obtain information from me at mariongundersonart@gmail.com (515-465-2746). Information is also available at the Rolfe Public Library (712-848-3143) and at Wild Faces Gallery (712-848-3399). It is now Sunday, the 6th: I had meant to have a link to an “order form” for sponsoring oral history tapes. 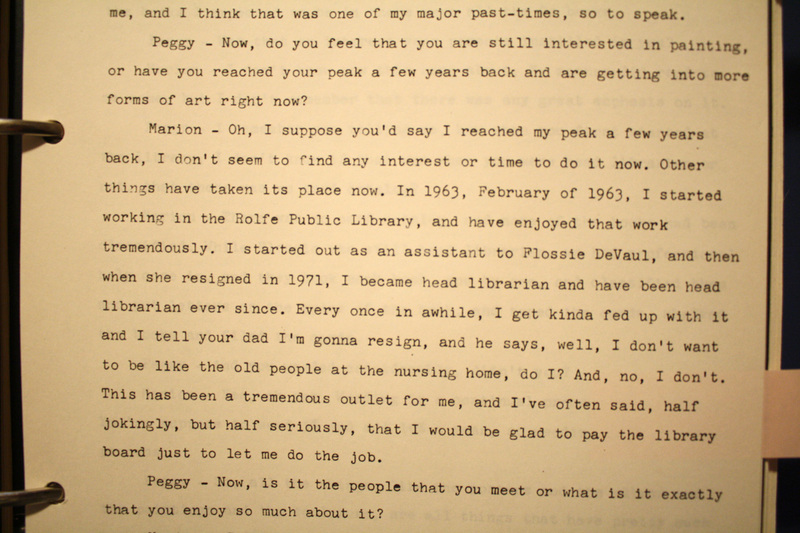 I also meant to update the “Oral Histories” link. Our Internet access went down late last night until right before I’m leaving for Rolfe today, so…no link and no order form yet. Soon, though, or via email, phone, or in Rolfe today works, too. Tally-ho! I’m soon off to the festivities at Rolfe. This entry was posted on December 5, 2009 at 10:04 pm and is filed under Iowa, Marion Gunderson, Rolfe. You can follow any responses to this entry through the RSS 2.0 feed. You can skip to the end and leave a response. Pinging is currently not allowed. Wow, I am amazed at how well this endeavor is being done! A huge THANK YOU to everyone contributing time, talent, money, other! Mother would be SO PLEASED. In fact, it feels to me like you are following in her footsteps, Louise, in being passionate and creative about preservation. Bless you!